Receive all the latest updates when you follow The Black Cat Closet on social media. The pearly full moon flanked by the waxing and waning crescents symbolize the Triple Goddess of Wicca; the Maiden, the Mother and the Crone, invoking, amongst other atributes healing, occult protection, perfection and wealth. 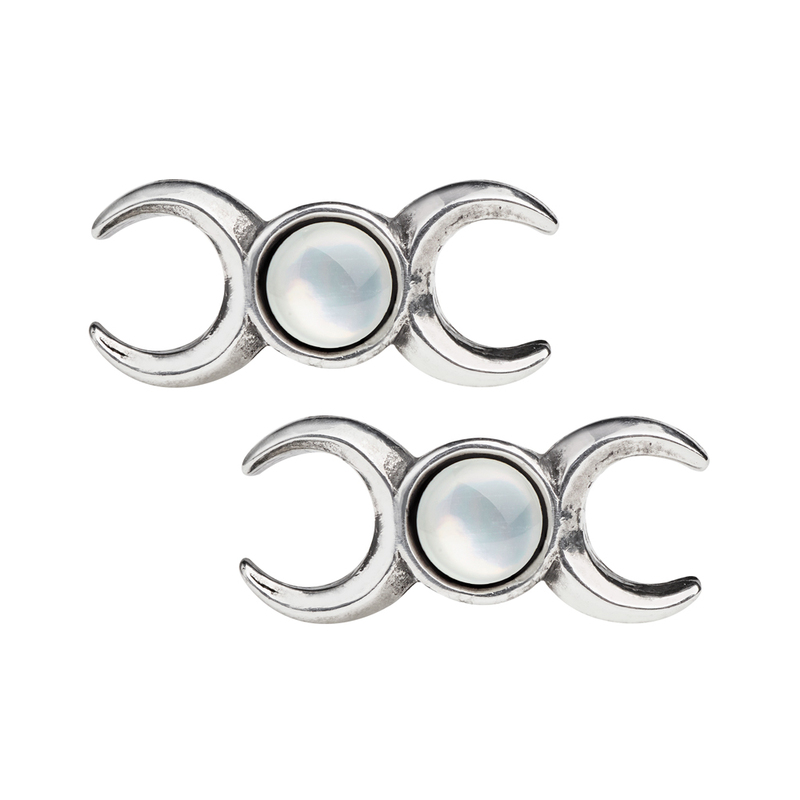 A small and discreet pair of pewter ear studs in the shape of the three phases of the moon, with a small mother of pearl cabochon as the central full moon . With surgical steel ear posts and plastic scrolls. Width 0.75" x Height 0.35" x Depth 0.63"
Additional Information: All earrings are cast and hand-made in fine English pewter, many with additional high quality components, and all come complete with either surgical steel ear-wires or, if studs, with sterling silver posts and plastic butterflies. 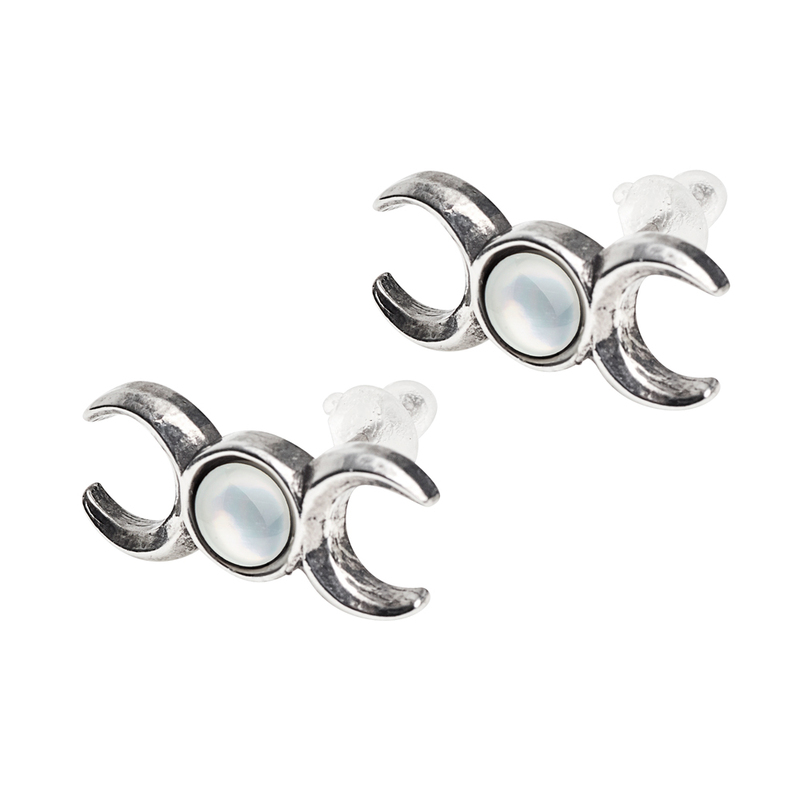 Earrings are sold singly unless indicated in pairs. ***Important*** Please allow at least 12 BUSINESS DAYS for your Alchemy Gothic product to ship out since each item is special ordered for you. Please plan on this if you need the item(s) for a specific date or occasion.